Two developers plan to submit plans to turn the decaying old Hotel Alexandra at Washington Street and Massachusetts Avenue into a ten-story boutique hotel that will retain the old building's facade. 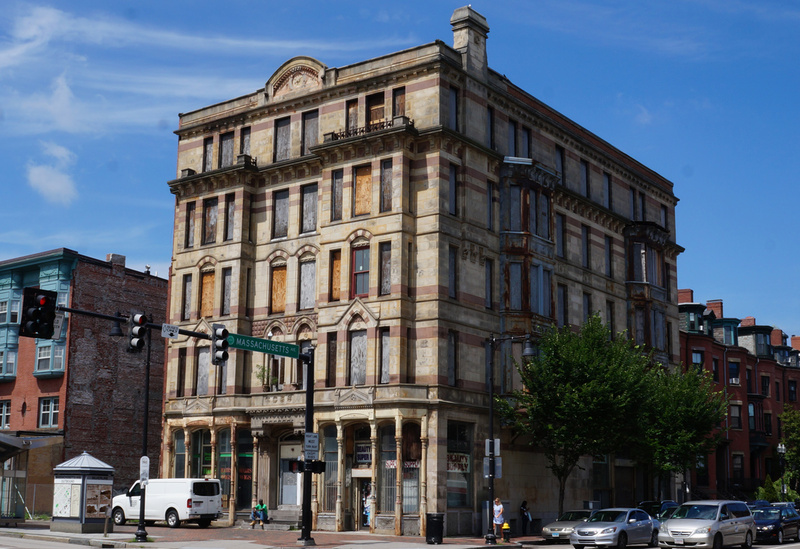 In a letter of intent filed with the BPDA, developers Jas Bhogal and Thomas Calus say they will buy the 1876 building from the Church of Scientology and turn it and the vacant parcel next door on Washington Street into a "Class A boutique-style hotel" with a ground-floor restaurant, conference rooms and a "rooftop amenity space." The church bought the building in 2008 for use as its Boston headquarters, was unable to raise the money it needed to restore the building, then decided it wasn't big enough anyway and is now building out a headquarters on Lincoln Street in Brighton. Possible deals with two other developers fell through last year. In their letter, Bhogal and Calus said they would use the space on Washington Street that became vacant after the equally historic, but smaller, Ivory Beane building, had to be torn down after it began to collapse. They are not planning on including any parking spaces for guests "given the site constraints and the ample availability of public transportation." Developers' letter of intent (638k PDF). This building has been neglected for far too long. This building is located in the South End Historic District. Owned by Peter Bakis of Roslindale for many, many years before it got in the hands of the Scientologists. My understanding is that they were allowed to take down the adjacent Ivory building by the City and the Historic Commission under promises of renovation which never came to fruition. Now we have a plan for the building which will barely resemble the Alexandra in its glory with just the facade to remain. I have been through the building on a number of occasions and although it doesn't look like much from the outside, the inside is in structurally sound condition with modern top floor roof and structure supporting it. Inside the building has been gutted and is ready for the major renovation that the building and this street corner so richly deserve. The building in my opinion is economically viable in its present configuration. Whether it is economically viable depends purely on the price paid for the building. The end sales or rentals of the building are well known by real estate professionals, the renovation costs are known by building professionals, so the only variable that determines the profit in the building is the sales price (and the future market of course) In todays real estate market there is plenty of money to be made if the selling price is in line with the buildings worth. However, if you can get the City, the Historical Commission, and the Zoning Board of Appeals to allow you to build an extra five stories, this adds tremendous value to the project of course. Five extra stories of hotel rooms or condos obviously add a lot of value. It will be very interesting to see if the agencies, especially the historic commission, gives approval for the project. I also wonder if they will request Historic Tax Credits for the project which are approved by the Secretary of State's office. Maybe that would be an interesting question to ask candidates Galvin and Zakim: "Do you support Historic Tax Credits for a project that significantly alters how a historic building looks and is configured?" Whether it is either an Historic renovation of the Alexandra and fill in building that conforms to zoning, or a new 10 story boutique hotel, I think the neighborhood would much prefer an active building than the boarded up ghost of this beautiful historic landmark. If there is another five stories added on, I'll assume that your 'structurally sound' comments are irrelevant because of the added loads of the addition. Is this true and if so, then is it literally a facade with a new steel structure and total modern building inside? I assume the addition will resemble the existing building. I understand the added value but can it really be called historical? I'm thinking historical tax break-wise. I did some work on an old barn a while back (inexpensive repairs, not a 'real' restoration) where it was decided to use 2x stock to intentionally make it look modern. They want restoration, they can come up with $$$ for hand carved pegged beams. I'm also thinking of the old Customs House that started out so small. My opinion? It could be a site like the Vendome. Buildings like that, vacant for so long are killers even (and especially) when they are being renovated. Anything done with it is good in my opinion. Great use of the word 'killers'. Going by that building on the bus I always admired what a handsome, building it is, even in it's deteriorated condition. I am glad it is getting a new life. That place looks so haunted! What about the beauty supply store that is currently located on the ground floor? I could have sworn I heard that the Scientologists gave them a fifty (or something in that ballpark) year lease for a song. Did the developer buy them out? That building has been derelict for a long time. Would be nice to retain the current height, but I think it's time to embrace any reuse of the spot. We used to skip skool to get all the hip records there! Just it's now in Egleston (a few blocks away from what could be Boston's last video store). What about Uncle Ned's? Anyone else remember that? I can only assume Uncle Ned has retired his green eye shade and brass knuckles at this point. has more character in it than huge swathes of actual Boston today does . .
By that you mean soot, rats, muggers and thieves, and generalized decay. Been a while since I broke my foot stepping off a sidewalk - oh woe is me! The character of being maimed by broken infrastructure has gone! Who needs functioning limbs! I love seeing news like this. And the fact that one more beautiful building is out of the hands of the comedy group known as the Church of Scientology, this is a project we can all support. So it's going to be a boutique hotel catering to people who are not arriving by car? Logan to there in a taxi or car share is feasible. They have a lot of faith in people wanting to come with bags on the SL3, Orange line or 1 bus but I'm assuming someone has done research on how boutique hotel travelers normally get around Boston. But I can already feel the angry mob gathering that doesn't want a "10 story monstrosity" in their neighborhood and doesn't understand why they can't just fix it up as is. As one other commenter here has already plainly stated it's "economically viable" in its current configuration without showing their work or any other explanation beyond nostalgia. My vote is to let the thing fall down on itself, then leave it to the neighbors who end up dragging this process out for several years to clean up the mess and hope for a savior who will restore this thing to its former glory for free. Where did you helicopter in from? I've been doing historic renovations in the City of Boston for over 25 years. I shouldn't assume that an 'anon' would know that just since I post under my real name. I've restored buildings in the South End in much worse structural condition than this one built from roughly the same time period (1863 to 1910). This building is particularly unique as it is so large and beautiful, has not been altered in any major structural ways over the years, and sits at the crossroads of two of the most important streets in Boston. Let's make a rough estimate that the building has 5000 square feet per floor. That's 25,000 square feet for the building. (Please excuse my memory on the exact figures, I haven't looked at the building plans in years, this is a rough ballpark). Finished high end condos in the South End are selling at roughly $1,000 per square foot. That gives you end sales numbers of $25,000,000. Commercial space and hotel space are generally valued at higher, but I'll stay with the $1000 a foot as a safe number. Renovation costs can run typically from $400 to $700 a foot. Let's stay on the safe side and say $700 a square foot for renovations which is $17.5 million dollars, and let's throw in another $500,000 for soft costs, financing, etc. That leaves $7 million dollars to play with, as well as the vacant parcel next to it. That parcel if rebuilt would have roughly 4000 square feet which could bring (after construction and sales figures similar to above--even though new construction is easier than renovation) roughly $1 million more. Let's say the developer wants to make at least $2 million profit on this 2 year project. That leaves about 6 million dollars to buy the building and the parcel next to it. The city has the two parcels valued at about $4 million dollars. This is where the 'business' sets in. The current owners have had carrying costs, etc. How much are they into the property for? They likely paid too much for it in 2008. So, they are holding out for the real estate market to keep going up so they can recoup or gain as much money as possible OR they make an option contract with a developer who proposes a project 10 stories high that makes the project worth much more than it currently stands. This is the value of zoning variances. It isn't a matter of nostalgia, it's a matter of the sales price asked for by the seller. There is an old real estate truism "you don't make your money when you sell a project, you make your money when you buy the project". It is up to the neighbors and the various city agencies whether they are willing to have a 10 story building that towers over everything in the neighborhood (the 5 story building currently there dwarfs everything else now) in order to get the project done sooner rather than later. The seller will get their money, the developer will make his profit, the neighborhood will have a modern 10 story tower with an historic facade in a unique historic district. The other option is the neighbors and the City say clearly and unambiguously that they want the building restored to its former glory in its current configuration. The Scientologists would likely then have to sell the building for $3 to $6 million dollars or keep holding on to it until real estate values get up to the level they want. As I said in my earlier post, it will be interesting to watch what happens with the project. I do think getting something done will be a boon to that major intersection and the neighborhood. And my point was .. Regarding the "anon", I think s/he doesn't know some of the history of this parcel or doesn't appreciate the years (decades) that neighbors have been putting up with this mess, having to deal with proposal after proposal. (Look at that photo from 1986 - that's 32 yearssss ago). The neighborhood association(s) have been ready to work with any developer/buyer. The previous proposal topped out at 8 storeys (two additional), I think; perhaps they'll go to ten on this. Myself, I'm ready to see it brought down, combined with the empty lot next door, and built fresh. Sometimes I think we get used to all the beautiful historic buildings in Boston that we start to take them for granted and forget what makes Boston so unique and such a tourist destination. Kansas City, Houston, Boise, etc. all have new modern 10 story buildings No one is ever going to schedule a trip there to see the beautiful old buildings. Do you like 0 Worcester Square? How about the bank of america ATM lobby across the street from the Alexandra? I was talking with former Governor Mike Dukakis last year and he was telling me about some of the great buildings on Huntington that were torn down due to Urban renewal. He felt it was a real shame that we have lost those buildings and got me to buy a book on 'what we have lost' about old buildings in Boston. I'd hate for us to lose this building, even if just the facade over what is essentially a couple million dollars. if most of the new buildings weren't so crappy. Old buildings were made to delight people looking at them from the sidewalk, and make their owners proud. They had detail and what I call "rhythm". A beautiful 19th century American building is the visual equivalent of a drummer playing an amazing compound pattern. New buildings are designed to look impressive in renderings, from angles that people will never actually see them, go up fast, and cost as little as possible. The lip-service they pay to any kind of design form is almost insulting in its cynicism. Of course people will be coming by car. They just don't have any place to park on property. They will do what everyone else does: Have valet parking that runs in and out of other garages in the area. If you're the hotel operator you just try to cut the best deal you can with the likes of the Hancock or the Pru garage. Then you overcharge the guest anyway. Their claim that they will cater to people arriving by T is a bit silly. In an era when AirBnB is gobbling up apartments to use for hotel rooms because there supply-demand balance yields overly high prices, more hotel rooms will help stabilize (lower?) the price of a room. That squeezes AirBnBs out of the market, restoring them as... apartment rooms. It's imperfect to be sure, but more hotel rooms in Boston has the effect of more housing units too. Hotel availability was crushed by the same 'we're not building' stretch that aggravated the housing supply for years and years. Major conventions have been complaining about the shortage of rooms for a long time, and while the city has finally allowed more hotels to go up, we're playing catch up. This has contributed to the AirBnB issue. It may be hard to believe, but the Hotel Alexandra featured unheard-of luxuries at the time it was built, including a primitive elevator powered by a giant piston connected to the city’s water main. Built in 1876 and designed in the High Victorian Gothic mode at the peak of the style’s popularity, it was an early Boston example of an apartment-hotel and home to long-term, rather than short-term, renters. The elevator shaft is still there! And it is huge, framed out in all wood, much bigger than private elevators today.